Dreamfoil Creations has posted a short video of the checklist book in the upcoming Robinson R22 for X-Plane. VertigoStudios has released the Expansion Paint Pack and Paint Kit to the Grumman TBF Avenger for FSX. Scott a.k.a. nightsta1ker has released FDE update 2 to the Nemerth Designs MD 500 Defender for FSX. •Fixed ballooning with full down collective, can now perform quick-stops and steep descents without needing to slow down below ETL. Descent rates up to 1500 FPM. hovering autorotations are now possible. Descent rates up to 2000 FPM. so right pedal is required at cruise. •More sensitive control feel. The MD-500 is a very responsive helicopter, I tweaked the sensitivity so that it is more responsive to the touch. The overall effect is that we now have a brand new helicopter. This thing flies nothing like the default Defender and is much more realistic. second release (available above) is even better in my opinion. Turbine Sound Studios (TSS) has posted another preview video from the Airbus 340 CFM HD Sound Package for FSX. 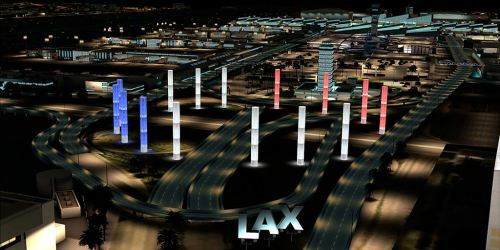 FSDreamTeam has released the long-awaited Los Angeles International Airport (KLAX) for FSX. Special runway lights, including FAROS, RWSL, THL and REL. 123 Jetways animated with inverse-kinematics in FSX. Drzewiecki Design has announced development of Polish Airports Vol.3 for FSX and FS2004. The Carenado Cessna C337 Skymaster for FSX is now available to purchase at SimMarket. More livery preview pictures have been posted from the upcoming MilViz F-15E Strike Eagle for FSX. McPhat Studios has released World Airliners 2 High Definition Textures (HDT) for the PMDG Boeing 747-400. IRIS Flight Simulation Software has posted a preview image of the upcoming Alenia EC-27J Spartan for FSX. Orbx has posted another random image from the upcoming Anacortes Airport (74S) for FSX. Orbx has posted several night screenshots from the upcoming Essendon Airport (YMEN) for FSX. feelThere is offering a 30% discount on selected items during the Autumn Sale. Valid until September 18th 2011. Aerosoft has posted more development pictures from the Rockwell OV-10 Bronco for FSX. Aerosoft is offering a 25% discount on the WWI Flight Simulator “Rise Of Flight". Alf Denham has released the freeware Cornelius-Moore (Polk County) Airport (4A4) for FSX. Available to download at Flightsim.com - AVSIM - Simviation. Hai Trieu Pham Lam has released the freeware Cat Bi International Airport (VVCI) for FS2004. Download at AVSIM. The Let L-410 Turbolet project for X-Plane custom prop animations video can be viewed at YouTube. X-Plane Flight School has added the lesson X-IFR 6 - The ILS in the X-Plane.org Forums. VertigoStudios has posted more development renders from the de Havilland DH.98 Mosquito for FSX. Computer Pilot - Volume 15 Issue 5 - September/October 2011 is now available as PDF at SimMarket. McPhat Studios has posted the first nighttime cockpit preview picture from the ATR 72-500 for X-Plane. Turbine Sound Studios (TSS) has posted another preview video from the upcoming Airbus 340 CFM HD Sound Package. CaptainSim has released the Boeing 737-200 expansion for FSX. More information at the CS Website. Leading Edge Simulations has posted more development renders from the Douglas DC-3 for X-Plane. New York LaGuardia Airport (KLGA) for X-Plane is now available to purchase at the X-Plane.org Store. McPhat Studios has posted an wing comparison screenshot from the upcoming PMDG 737 NGX High Definition Textures. FSDreamTeam has posted a promotional video from Los Angeles Intl. Airport (KLAX) for FSX and FS2004. Cera Simaircraft has released the Bell 222 for FSX. More information and purchase at SimMarket. Main and tail rotors fully animated. Khamsin has posted a preview video from version 1.2 of the North American T-28C Trojan for X-Plane. The Microsoft Flight Team has posted an article on cloud blending in the upcoming simulator at the Flight Website. Aerosoft has released the long-awaited Corfu X (LGKR) scenery for FSX. Available at Aerosoft or SimMarket. Several new screenshots of the Lockheed F-104 Starfighter have been posted at the A2A Simulations Facebook Page. Gregory Putz has released the freeware Prince Albert (Glass Field) Airport (CYPA) for FS2004. Download at AVSIM. The freeware Lugano Airport (LSZA) for X-Plane is now available to download at X-Plane.org. Angelo Tassoglou has released his freeware Achaia photo scenery for FSX. Download at AVSIM. The Microsoft Flight Team has posted new screenshots from the upcoming simulator at the Microsoft Flight Website. New cockpit and exterior preview renders have been posted from the Beriev Be-200 project for X-Plane. New preview renders have been posted from the upcoming Beechcraft 2000 Starship for X-Plane. The Canadian Rockies scenery for X-Plane by Tom Curtis has been updated to version 1.30. Available at X-Plane.org. -I have begun updating the quality of many of the static aircraft located around the airports. Thes aircraft have highher resolution textures and cast shadows on the ramp. -I wasn't satisfied with the default textures X-Plane uses in areas that are designated "semi-arid" land class. It looked too brown for my personal taste so I have included a library file that modifies these textures to make them a little more green.